This is a belated gift for a new baby. He is now 14 months old. Eh, who’s counting? Pattern: Though the pattern is my own, it’s styled after the Fisherman’s Pullover by Lee Gant in 60 Quick Baby Knits (my review of that book here), as well as this Janie and Jack cabled sweater. Once upon a time, I had actually started that Fisherman’s Pullover using this very yarn, but found that the fabric came out very bulky – too much cabling for such a little sweater. The silhouette appealed to me, however, so I decided to swap smaller cables that would add texture, but not as much bulk. If the stitch pattern looks familiar, that’s because it’s the same one I used in the Shifting Sands scarf pattern. Yarn: Cascade 220 Superwash, 100% superwash wool, in color #1926, doeskin heather. This sweater used up about 2.3 skeins (520 yards). Needles: US 4 for the ribbing, US 6 for the body. Finished dimensions: 23″ chest circumference, 12″ from shoulder to hem, and 8″ sleeve length to underarm. I aimed to make this an 18-month size, and I think I got pretty close. I found the collar of this sweater to be simply impossible. I am not sure where I went wrong: did I make the neck hole too deep or too wide, too shallow or too narrow? Did I pick up the wrong number of stitches, or knit the ribbing to the wrong length? No matter what I tried, it seemed to me that the collar was coming out too high and too closed up. 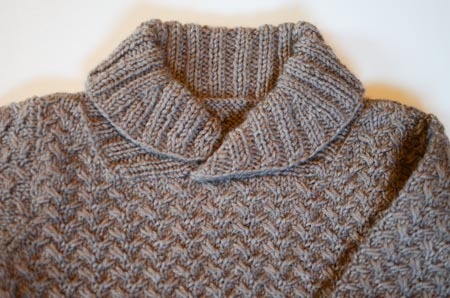 I finally made the collar work, but not before adding short rows and increases to make it spread out and away from the neck, and seaming it at least a dozen times. Ugh! I think I don’t want to see another shawl collar for a long while. Gorgeous. It is from reading your blog that I have learned that ripping is an integral part of knitting and not to be afraid. Irritated, yes, but rip and knit. It looks beautiful. congratulations. I love the texture. That little sweater turned out great! The shawl collar is really cute, probably better for a toddler than a really young infant. You may have struggled with the collar, but it looks great now! And no one is counting, LOL! Nice sweater! I made a pattern from that baby book (the Tiny Tux) and ended up using the C220 sportweight rather than the regular superwash. The patterns don’t quite work with the regular. 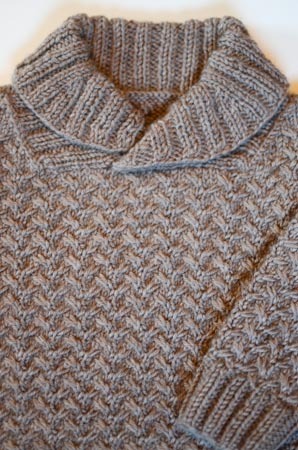 It’s possible that the cable fabric in the original Fisherman would be OK in a thinner yarn. Anyway, beautiful work! I left a comment a few days ago, but don’t see it so I’m not sure if you ever received it. 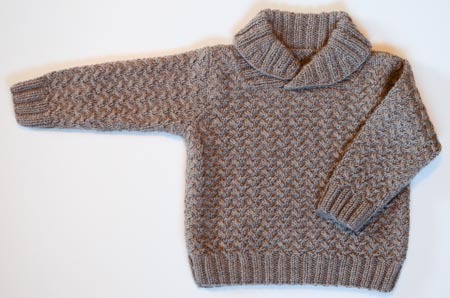 Lovely job on the sweater – I have wanted to make that one as well, and agree that the original cabling is pretty heavy for a toddler sweater. Nice choice to change the cabling. I’ve made this and it has a similar collar. They are a bit tricky! I love the “hugs and kisses” cabling on this (rather hard to see on the pattern page, but much better on the project pages).